Additional Info: I am a professional harpist currently based in Brisbane, Australia. I graduated from the Queensland Conservatorium of Music in 2015 with a Bachelor of Music in Harp Performance, under the tutelage of Sebastien Lipman. 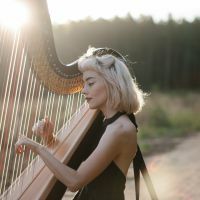 I have a large amount of experience as a solo harpist, as well as an orchestral harpist, and play frequently with a number of Queensland's orchestra's. I have been engaged to play in orchestra's on the tours of celebrities including Josh Groban's recent tour. I also play at weddings, funerals, corporate events and private functions. I am very passionate about using the harp for music therapy, and frequently play at hospitals and hospices. I also work as a harp and piano teacher.